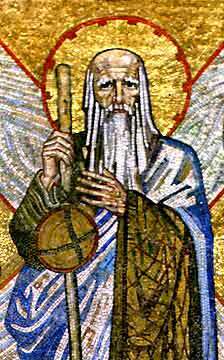 St Andrew the Fisherman stands with his net over his arm, and his staff in his right hand. On one side is the figure of St Margaret, Queen of Scotland. In her hands - the black cross known as the Holy Rood of Scotland, which has at its centre a fragment of the True Cross, given to her ancestor by Charlemagne. On the other side stands St Mungo, also called St Kentigern, who founded the diocese of Glasgow. The salmon at his feet with a ring in its mouth refers to a legend in which the saint miraculously saved an unfaithful wife from the anger of her royal husband. Behind is the X-shaped cross on which St Andrew was said to have been martyred. 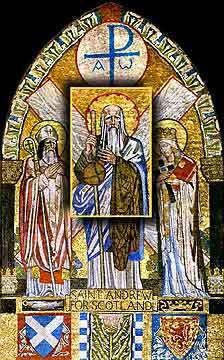 Andrew was one of the Christian Apostles, the brother of Simon Peter: but his later history is obscure. Unfortunate experiences with frescoes at the Palace of Westminster led the Fine Arts Commissioners to change their original plan, and commission mosaics for the four patron saints in the Central Lobby. Interest in mosaics in the 19th Century had been growing, fuelled by the enthusiasm of Dr Salviati, the man responsible for restoring the mosaics at St Mark's in Venice. Dr Salviati's firm was then commissioned by the Fine Arts Commission to undertake the implementation of mosaics in Central Lobby - from the designs of Sir Edward Poynter (1836-1919). Saint George and Saint David were installed in 1869. However, by the 1920s the decoration of the Central Lobby had fallen into abeyance, and Dr Salviati had died. So the commission for the remaining two Patron Saints was awarded to Robert Anning Bell (1863-1933), who was also responsible for two large mosaics in St Stephen's Hall. 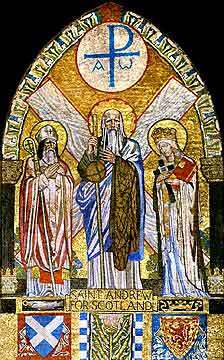 Bell worked on the spot, rather than in the studio, and the mosaics of Saint Andrew and Saint Patrick were finally unveiled in 1923.